My first book, Living Translation: Language and the Search for Resonance in U.S. Chinese Medicine, is available from Berghahn Books. Integrating theoretical perspectives with carefully grounded ethnographic analyses of everyday interaction and experience, Living Translation examines the worlds of international translators as well as U.S. teachers and students of Chinese medicine, focusing on the transformations that occur as participants engage in a “search for resonance” with foreign terms and concepts. 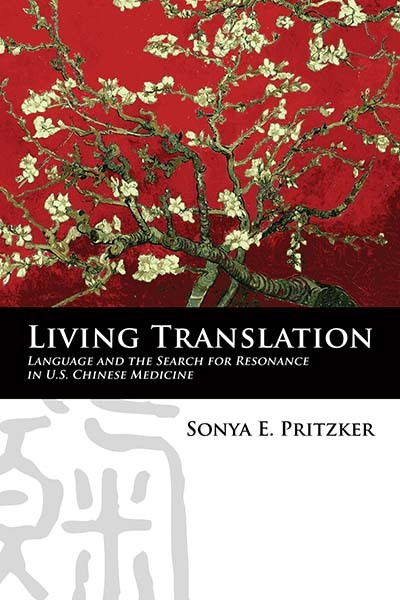 Based on a close examination of heated international debates as well as specific texts, classroom discussions, and interviews with publishers, authors, teachers, and students, Sonya Pritzker demonstrates the “living translation” of Chinese medicine as a process unfolding through interaction, inscription, embodied experience, and clinical practice. By documenting the stream of conversations that together constitute this process, the book thus traces the translation of Chinese medicine from text to practice with an eye towards the social, political, historical, moral, and even personal dimensions involved in the transnational production of knowledge about health, illness, and the body. ​Other publications are listed below. (2014) Pritzker, S.E. Living translation: Language and the search for resonance in U.S. Chinese medicine. Oxford & New York: Berghahn Books. (2014) Pritzker, S.E., H.M. Zhang, & K.K. Hui. Considerations in the Translation of Chinese Medicine. UCLA Center for East-West Medicine. (In Press) Pritzker, S.E. Translating Chinese Medicine in the West. In Vivienne Lo and Michael Stanley-Baker, Eds. Routledge Handbook of Chinese Medicine. Oxford: Rutledge. (2017) Pritzker, S.E. Translating Chinese Medicine: History, Theory, Practice. In Chris Shei and Zhaoming Gao, Eds. Routledge Handbook of Chinese Translation. Oxford: Routledge. (2016) Pritzker, S.E., Hui, E.K.W, Ochs, S., & Hui, K.K. Aging and Mental Health from an Integrative East-West Perspective. In Helen Lavretsky, Martha Sajatovic, and Charles F. Reynolds III, Eds. Complementary, Alternative, and Integrative Interventions in Mental Health and Aging. Oxford & New York: Oxford University Press. (2013) Pritzker, S.E. Textuality and truth in U.S. Chinese medicine education (short vignette). In T.J. Hinrichs and Linda Barnes, Eds. Chinese Medicine and Healing: An Illustrated History, p. 318. (2012) Pritzker, S.E. Standardization and its discontents: Four snapshots in the life of language in Chinese medicine (book chapter). In Volker Scheid and Hugh MacPherson, Eds. Authenticity, Best Practice, and the Evidence Mosaic:Integrating East Asian Medicines into Contemporary Healthcare, pp. 75-88. (2012) Pritzker, S.E. Transforming Self, world, medicine: The trend toward spiritualization inU.S. Chinese medicine (short vignette). In Volker Scheid and Hugh MacPherson, Eds. Authenticity, Best Practice, and the Evidence Mosaic: Integrating East Asian Medicines into Contemporary Healthcare, p. 203. (Forthcoming) Pritzker, S.E. Language and Emotion. In J. Jackson (ed). Oxford Bibliographies in Anthropology.New York: Oxford University Press. (Forthcoming) Leung, G., E. Ho, H.L. Chi, Y.Q. Chen, I. Ting, SY Huang, H. Zhang, S.E. Pritzker, E. Hsieh, & H.K. Seligman. “We (Tang) Chinese”: Cantonese Chinese Americans’ Identity Positioning for Health Management. Journal of International and Intercultural Communication. (Forthcoming) Pritzker, S.E.,J. Guzman, K. Hui and D. Tarn. Th e Third Speaker: The Body as Interlocutor in Conventional, Complementary, and Integrative Medicine. Communication & Medicine. (2018) Pritzker, S.E. and K. Liang. Semiotic Collisions and the Metapragmatics of Culture Change in Dr. Song Yujin’s “Chinese Medical Psychology.” Journal of Linguistic Anthropology28(1): 43-66. (2016) Pritzker, S.E. New Age with Chinese Characteristics? Translating Inner Child Emotion Pedagogies in Contemporary China. Ethos 44(2): 150-170. (2014) Pritzker, S.E. Standardization and its discontents: Translation, tension, and the life of language in contemporary Chinese medicine.East Asian Science and Technology Studies 8: 25-42. (2013) Pritzker, S.E., M. Katz, & K.K. Hui. Person-centered medicine at the intersection of East and West. European Journal of Person-Centered Medicine 1(1): 209-215. (2012) Pritzker, S.E. Translating the essence of healing: Inscription and interdiscursivity in U.S. translations of Chinese medicine.Linguistica Antverpiensia, New Series: Themes in Translation Studies 11(2012): 151-166. (2012) Pritzker, S.E. & K.K. Hui. Building an evidence-base for TCM and integrative East-West medicine: A review of recent developments in innovative research design. Journal of Traditional and Complementary Medicine, 2(3): 158-163. (2012) Pritzker, S.E. Theorizing mind in Chinese language and medicine. Suomen Antropologi: Journal of the Finnish Anthropological Society 36(4): 55-57. (2012) Pritzker, S.E. Living translation in U.S. Chinese medicine. Language in Society 41(3): 343-364. (2007) Pritzker, S.E. Thinking hearts, feeling brains: Metaphor, culture, and the self in Chinese narratives of depression. Metaphor and Symbol 22(3): 251-274. (2007) Phillips, M.R., Q.J. Shen, X.H. Liu, S. Pritzker, D. Streiner, K. Conner & G.H. Yang. Assessing depressive symptoms in persons who die of suicide in mainland China. Journal of Affective Disorders 98: 73-82. (2007) Hui, K.K. & Pritzker, S.E. Terminology standardization in Chinese medicine: The perspective from UCLA center for east-west medicine (parts I and II). Chinese Journal of Integrated Medicine 13(1): 1-5 & 13(2): 152-155. (2005) Bing, Y. & Pritzker, S.E. Investigation on bei die. Chinese Journal of Medical History (Zhonghua Yishi Zazhi) 35 (4): 206-208 [in Chinese]. (2003) Pritzker, S.E. The role of metaphor in culture, consciousness, and medicine: A preliminary inquiry into the metaphors of depression in Chinese and Western medical and common languages. Clinical Acupuncture & Oriental Medicine 4(1): 11-28.